I have always had a good sense of this, but there came a point in the aftermath of the NFC Championship game when I had to cut off the attention. The incident was so polarizing that you had to pick a side. You either hated it or you loved it. I looked at Twitter and I saw two guys having a conversation about me in Spanish; I was going to Google translate it, but I just decided to let it go. Remember, these are tweets just from today, nearly two full weeks after Sherman first hit the headlines. And Sherman has brushed almost all of them off. There are always going to be people who don't like you. That's life. There are also always going to be people who don't agree with you. But the only way for you to come out looking like the better person is to not engage. Say nothing, and they can't say anything back. 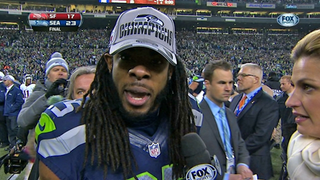 Taking the high road is good on Richard Sherman, it's good on you, and it's good on everyone.